Olive tree blight: Xylella fastidiosa is threatening millions of groves in Italy. Unfortunately, you can’t really extend the olive branch to bacteria. The olive tree groves of South Italy are currently facing two grave threats. The first is from Xylella fastidiosa, a potentially devastating bacterial disease—the second from European Union efforts to contain it. The European Commission, the executive arm of the EU, believes that at least 10 percent of the 11 million olive trees in Lecce, a southern province of Italy, may be infected with Xylella fastidiosa, an infection known to harm olive trees as well as citrus fruits and grapes. To halt the spread of the disease, the commission has already urged Italy to cut down all infected trees and is expected to propose new emergency measures at a meeting later this week. But a representative for the European Food Safety Authority told the BBC that even those efforts might not be enough. “Even trees not showing symptoms might carry the bacteria, which makes it really difficult,” he said. Italy has historically been the second biggest olive oil producer in the EU after Spain. From 2013 to 2014, it accounted for some 461,000 tons, or nearly one-third, of the total 1.5 million tons the bloc produced, according to data from the International Olive Council. For the current year, though, that output is expected to plummet to just over 300,000 tons, putting Italy roughly on par with Greece and far behind Spain. 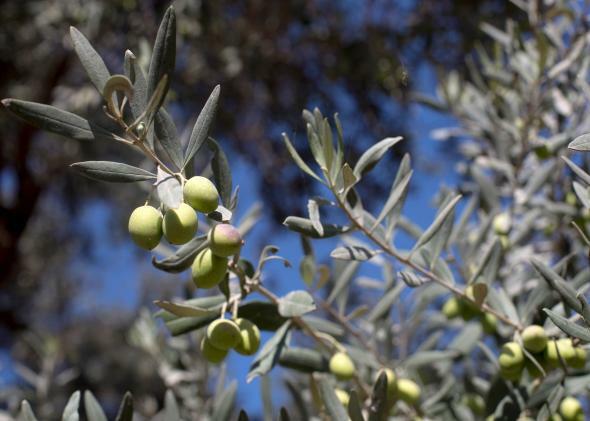 Combined with a bad drought in Spain, the blight has pushed olive oil prices sky-high. In December, the International Monetary Fund said that premium-quality extra virgin olive oil had climbed to $4,282 a ton—the highest wholesale price since 2008. In February, the price added another nearly 5 percent from the previous month. At any rate, a tighter supply of olive oil globally might end up giving a slight boost to California’s burgeoning olive oil scene. While U.S. olive oil production is still a small part of the international market, it’s increased tenfold to 10,000 tons since 2007, and growers in California have been seeking quality regulations that would make them more competitive with European producers. In the short term, Xylella fastidiosa might end up doing the same.